1. IT’S BASED ON A COMIC BOOK, WHICH WAS INSPIRED BY TWO TRAGEDIES. 2. THERE WAS INTEREST IN TURNING THE COMIC BOOK INTO A MOVIE EARLY ON. The Crow comic book debuted on February 1, 1989. Shortly after the second issue came out, O’Barr—who at that time was doing auto body work—was approached by a young director who was interested in buying the rights to The Crow for a one-time lump sum. “All rights, all media, in perpetuity,” O’Barr said in The Crow: The Movie, “but the money was pretty good, considering. I was going to do it.” But his friends convinced him to consult with a Hollywood agent, who advised O’Barr against selling the rights to the comics for a lump sum. 3. SHIRLEY AND MOST MADE SOME CHANGES TO O’BARR’S ANTIHERO. Shirley and Most got to work right away adapting The Crow into a script. They made a few changes, downplaying Eric’s drug use and bringing the love story to the fore. They also made the crow an actual animal—not just Eric’s psyche, as it is in the comics—that spoke to Eric telepathically. While Shirley worked on the script, Most took the treatment and the comics and went about shopping the screenplay. Eventually, independent producer Ed Pressman signed on to help make the movie, and for the next two years, Shirley honed the script. He added an older brother for Sarah (a version of a character from the comics), a young girl with a drug addict for a mother who befriends Eric and Shelly, and turned the Skull Cowboy, a manifestation of Eric’s mental anguish that appears three times in the comics, into a spirit guide. Eventually, O’Barr thought the creative team had gone too far with their changes, so he created a 10-page outline explaining his characters’s motivations to get them back on track. Not long after, horror writer David J. Schow (Leatherface: Texas Chainsaw Massacre III and Critters 3 and 4) came onboard to do a rewrite; he told Pressman that Eric Draven should be a “Gothic, rock and roll Terminator.” Schow cut back on the number of villains, gave the remaining ones a clear hierarchy, and added Devil’s Night as the motivating factor behind the initial attack on Eric and Shelly, “just to give the villains a more esoteric agenda,” he said in The Crow: The Movie. Making that decision also grounded the movie in Detroit, a city that regularly experienced fires and mayhem the night before Halloween. 4. THE PRODUCERS KNEW WHO THEY WANTED TO DIRECT AND STAR. Pressman had Alex Proyas, an Australian director who at that point had helmed music videos and commercials, but no features, in mind to direct The Crow. Though Proyas was very much in demand in Hollywood, he was waiting for the right project—and The Crow was it. He signed on in 1991. 5. LEE ASKED FOR ONE CHARACTER TO BE REMOVED. Once Lee signed on to star in The Crow, he read the comic book. “After the script was written, Alex [Proyas] and I went back to the comic book and tried to find the beats of the story that didn’t make it into the script,” Lee said at one point during production. Proyas took Lee’s feedback seriously, and often incorporated his changes into the script. That included cutting one super-villain, an Asian character out to steal Eric’s powers, who Lee thought was a stereotype. 6. IT WAS TOUGH TO GET THE MAKEUP RIGHT. There’s a persistent rumor that Eric Draven’s makeup was inspired by Alice Cooper or KISS—and it's a rumor that O'Barr denies. At a comics convention in 2009, O'Barr said that The Crow's look came from a marionette mask, which he saw painted on a theater in London: "I thought it'd be interesting to have this painful face with a smile forcibly drawn on." Regardless of what inspired the makeup, getting it right was very tough. It took between 35 minutes and an hour to apply the grease makeup, which could stay in place for hours; special effects artist Lance Anderson created a rubber mask that had slits in it, so that the pattern of lines around the eyes and mouth would be consistent. 7. DAVID PATRICK KELLY BOUGHT A VINTAGE COPY OF PARADISE LOST FOR THE PRODUCTION. Some of the actors cast as villains in The Crow went through training to portray their characters; Laurence Mason, for example, worked with stunt coordinator Jeff Imada to learn real-life knife-fighting moves in order to play Tin Tin. Others donned costumes: Michael Massee, who played Funboy, wore outfits inspired by Iggy Pop and some outfits taken directly from the comic. David Patrick Kelly, who played T-Bird, used a more literary inspiration to get into character: John Milton’s Paradise Lost. T-Bird quotes Milton in the flashback sequences; Kelly bought an antique copy of the book to use in the scene. 8. THEY USED RAVENS, NOT CROWS, DURING FILMING. Animal trainer Larry Madrid trained five ravens for the production. Because The Crow filmed at night—when ravens sleep—he had to get the birds accustomed to that, as well as flying in the rain (which is also unnatural for the birds) and in a wind tunnel. One of the ravens also had to be trained to be comfortable sitting on Lee’s shoulder. 9. THE PRODUCTION EMPLOYED PLENTY OF TRICKS TO GET ITS SHOTS. For one iconic shot in which Eric dumps a bunch of rings into the barrel of a shotgun and fires it, Proyas “cut to some oversized rings being dropped towards the camera through a puff of smoke,” he said in DVD commentary. “The way it’s cut, you really think you’re seeing a bunch of rings that were dropped into a shotgun.” The production didn’t have the money—or the space—to shoot a car chase sequence, so they did it with miniatures instead. And the final rooftop confrontation between Eric and head-villain Top Dollar (Michael Wincott) was shot not on the roof of a church, but on modular pieces, sitting on the soundstage floor, that were made to look like a gothic cathedral. 10. THEY USED SPECIAL EFFECTS, TOO. For a scene in which the crow attacks Myca (Bai Ling), Anderson built a mechanical bird to do the attacking; it had separate controls for the wings and the claws. His shop also built mechanical hands that looked just like Lee’s for a scene in which Eric is shot in the hand and his hand heals. “What we ended up doing,” Anderson said in The Crow: The Movie, “was closing it to a point and then taking filler and filling the hole in so it would close totally clean and go away, like stop motion.” They also created a full dummy of Top Dollar to be used in the climactic fight sequence where he’s impaled on the horn of a gargoyle. 11. O’BARR MAKES A CAMEO. He’s the looter who steals a television in the aftermath of the explosion at Gideon’s Pawn Shop. 12. WITH JUST A FEW DAYS LEFT TO FILM, LEE WAS KILLED IN A TRAGIC ON-SET ACCIDENT. The cast and crew worked long, grueling hours, in the rain and at night, on the set of The Crow, which was plagued by misfortunes almost from the start. In February 1993, a carpenter was seriously injured on set when the crane he was working in hit live power lines. That night, an equipment truck caught on fire. Later, a sculptor who had worked on the set for just a few days drove through the plaster shop after he was let go. A construction worker accidentally drove a screwdriver through his hand. Then, in March, a storm destroyed some of the sets. “The script of The Crow called for a close-up of the loaded weapon. The crew, following standard procedure, used dummy bullets, which are nothing more than bullets without gunpowder. When the close-up was finished, the gun was unloaded, then reloaded with blanks. Blanks sound as loud as real bullets, but when they are fired, only the harmless cardboard wadding with which they are packed is ejected from the gun. The crew didn’t realize that Lee was injured until Proyas called cut and the actor didn’t get up. He was rushed to the hospital, but doctors couldn't save him. Lee died later that afternoon; he was just 28 years old. After the accident, Paramount—which had agreed to distribute the movie—dropped out, leaving the film in limbo (Miramax eventually picked it up). Producers, with permission from Lee’s family, wanted to finish the film, and after a six-week bereavement period, the cast and crew returned to Wilmington to complete filming The Crow. 13. AFTER LEE’S DEATH, THE SCRIPT WAS REWORKED, AND ONE CHARACTER WAS CUT. The Skull Cowboy’s exposition was replaced with Sarah’s narration, and Eric only becomes mortal when the crow he’s been following is killed. 14. CUTTING-EDGE VISUAL EFFECTS WERE USED TO COMPLETE THE FILM AFTER LEE’S DEATH. In addition to having doubles stand in for Lee, and filming those scenes as long shots in shadows, the production relied on the VFX company Dream Quest Images to fill in some of the blanks. Using footage of Lee from other sequences, the visual effects company finished seven shots. In one sequence where Eric enters his abandoned lot, Dream Quest took a shot of Lee stumbling down an alley and digitally removed the background; by adding a matte painting of a doorway, they were able to make it look like he was actually walking into his apartment. In another shot where Eric sees himself in a broken mirror, Dream Quest once again digitally isolated Lee from an outside shot. Using a shot of a double in front of a shattered mirror as a guide, they were able to create a grid that allowed them to composite Lee’s image onto the mirror (you can see how they did it here). Even more extraordinary, the company did this on handheld footage—a far cry from most visual effects shots at the time, which were carefully planned and staged and shot with a steady camera (just-developed image-tracking software helped them pull it off). 15. EXECUTIVES WERE WORRIED THAT AUDIENCES WOULDN’T GET IT. 16. THE FILM WAS A HIT. 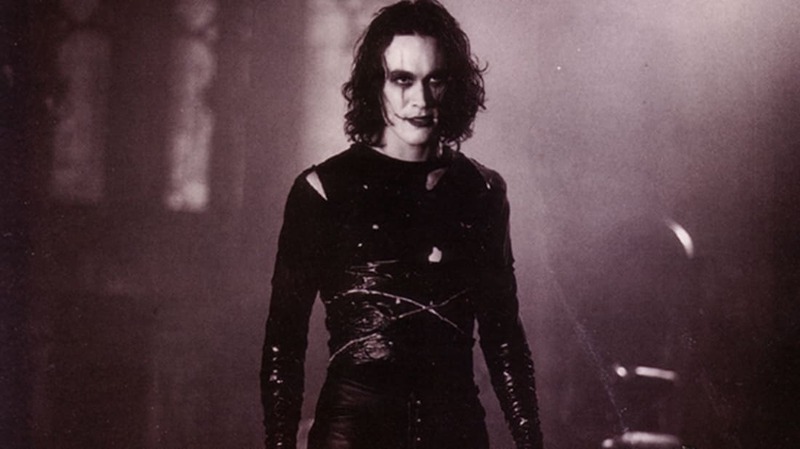 The Crow was released on May 13, 1994, and was the number one movie in America in its first weekend. Critics, including Roger Ebert and Rolling Stone’s Peter Travers, praised the movie. Its total domestic gross was nearly $51 million. 17. O’BARR DONATED MOST OF HIS PROFITS FROM THE FILM TO CHARITY. 18. IT SPAWNED SEVERAL SEQUELS. Even without Lee, though, the sequels came. The Crow: City of Angels, starring Mia Kirshner as Sarah and Vincent Perez as The Crow, Ashe Corven, was released in 1996. In 1998, there was a short-lived TV series called The Crow: Stairway to Heaven starring Mark Dacascos. Then, in 2000, Kirsten Dunst and Eric Mabius starred in another movie, The Crow: Salvation. That was followed in 2005 by The Crow: Wicked Prayer, which starred Tara Reid, David Boreanaz, and Edward Furlong. And Hollywood might not be done with The Crow just yet: A reboot has been in the works since 2008. It’s lost several stars and directors, and weathered a production company’s bankruptcy, but in 2015, original producer Ed Pressman said the reboot will shoot this year.